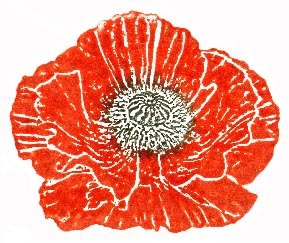 The open Poppy stamp been stamped with black StazOn ink on to blotting paper. 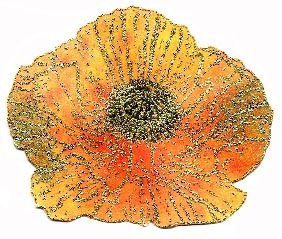 Radiant Rain Shimmering Mist (Poppy!) was then applied with a paintbrush. When dry the outline was stamped agin with Galaxy Gold Brilliance ink. 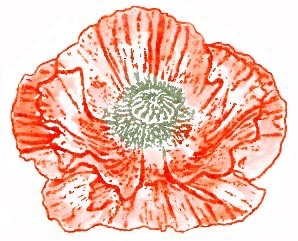 The solid poppy stamp has been inked with Fired Brick Distress ink. The centre was wiped off using a cotton bud and Black Soot Distress ink stippled on and then stamped on to card. The solid poppystamp has been inked with Pearlescent Poppy Brilliance ink, the centre wiped off and Lightning Black Brilliance ink stippled on and stamped on to card. 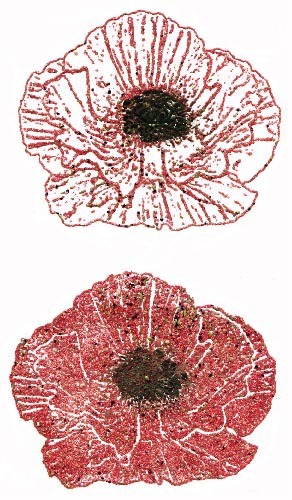 The open poppy stamp has been stamped on to blotting paper with Fired Brick Distress ink, the centre wiped off and black ink stippled on. 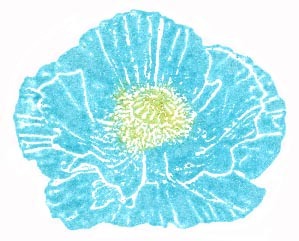 A wet paintbrush has been use to create the watercolour effect. 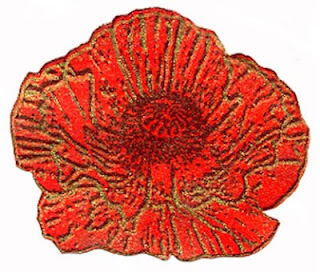 The open poppy design has been stamped and embossed with a gold tinsel powder on to blotting paper. Shimmering Mists were then applied with a paint brush. 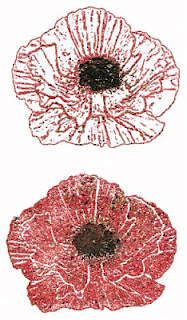 Both the open and solid stamps have been embossed with Stampendous Aged Scarlet powder. The centre then coloured with black ink...a mistake I think! This is a cover for a book or an Art journaling page. Blotting paper was sprayed with Dylusion Black ink and then with a spritz of Pearl Red Shimmering Mist. When dry the paper was stamped with a fern stamp and Galaxy Gold Brilliance ink. 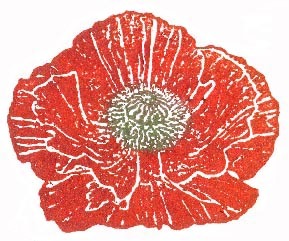 The solid poppy design was then stamped with the gold ink around the edge of the paper. 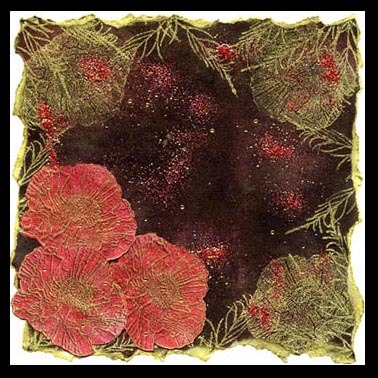 The 3 poppies were made by stamping on to blotting paper with Galaxy Gold ink and then colouring with Shimmering Mist applied with a brush. Aged Scarlet (Stampendous) embossing powder was sprinkled on to the paper in patches and heated to emboss (heat from underneath the paper). These are beautiful, can't wait to see you use blotting paper. Difficult to choose a favourite.